I have included the 3x and 6x together because many kids learn the 3 times but don't see the common patterns with the 6x easily. This format helps learning. There is a table ladder on each board for extra scaffolding but you can black this out if your students are consolidating and you want to develop more fluency. 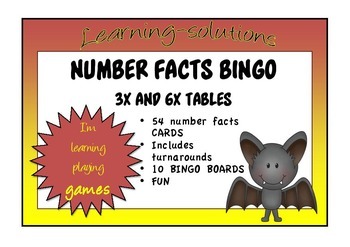 I use this game in Intervention as it provides the fun at the beginning or end of an intense session. You could use it in a Maths Centre as well. I have included 10 Bingo Boards so you can use it with a whole class with groups using one board and sharing the counters. Groups of 3 are ideal with each player having 3 counters each. This works well with mixed ability groups, so perfect for inclusivity.